Size - Weight usually 8 to 10 pounds, and should not exceed 12 pounds. Type and quality are of greater importance than weight, and a smaller dog that is sturdy and well proportioned should not be penalized. Proportion - Square, as measured from point of shoulder to rearmost projection of upper thigh and from withers to ground. Substance - Thickset, compact with good balance. Well boned. A very important feature. An almost human expression. Eyes set well apart, very large, black, prominent, and well open. The eyelashes long and black. Eyelids edged with black. Ears small and set rather high on the head. May be shown cropped or natural. If natural they are carried semi-erect. Skull large and round, with a domed forehead. The stop deep. Nose very black, extremely short, its tip being set back deeply between the eyes so as to form a lay-back. The nostrils large. Disqualifications - Dudley or butterfly nose. Lips edged with black, not pendulous but well brought together, giving a clean finish to the mouth. Jaws must be undershot. The incisors of the lower jaw should protrude over the upper incisors. The lower jaw is prominent, rather broad with an upward sweep. Neither teeth nor tongue should show when the mouth is closed. A wry mouth is a serious fault. Disqualifications - Bite overshot. Hanging tongue. Neck medium length, gracefully arched. Topline - Back level and short. Body - A thickset, short body. Brisket should be broad and deep, ribs well sprung. Shortcoupled. Tail - set and held high, docked to about one-third. Either 1) Red: reddish brown with a little black at the whiskers and chin allowable; 2) Belge: black and reddish brown mixed, usually with black mask and whiskers; 3) Black and Page Tan: black with uniform reddish brown markings, appearing under the chin, on the legs, above each eye, around the edges of the ears and around the vent; or 4) Black: solid black. Any white hairs are a serious fault, except for "frost" on the muzzle of a mature dog, which is natural. Disqualification - White spot or blaze anywhere on coat. Disqualifications: Dudley or butterfly nose. Bite overshot. Hanging tongue. White spot or blaze anywhere on coat. Click Here to Learn about breeder background checks on Brussels Griffon breeders if you are looking for Brussels Griffon puppies for sale. Click Here to learn how ResearchBreeder.com can help you find healthy Brussels Griffon puppies for sale. Click Here to order a Breeder or Kennel Background Check on Brussels Griffon Breeders that may have Brussels Griffon puppies for sale. 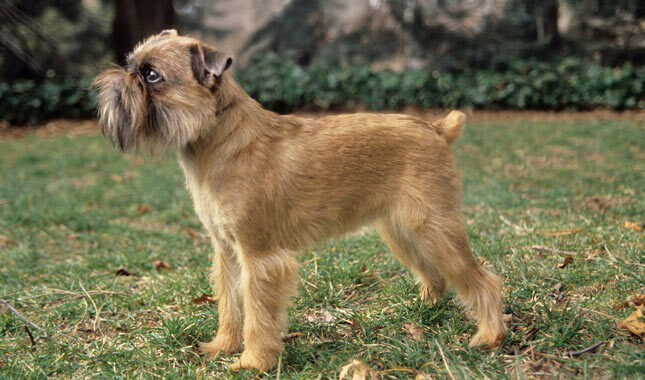 Click here to find the national breed club for Brussels Griffon puppies for sale. Click Here to purchase a list of approved ResearchBreeder.com Brussels Griffon Breeders who have Brussels Griffon puppies for sale.